In an apparent bid to raise his profile as Russia's most influential Muslim, Chechen leader Ramzan Kadyrov brought tens of thousands of people to the streets of the capital Grozny on Monday to protest what he called the "genocide of Muslims" in Myanmar. Violence over the past few days in Myanmar's Rakhine state has killed nearly 400 people and prompted thousands of ethnic Rohingya refugees to flee into neighboring Bangladesh. The Russian government has not been clear over its stance on what is going on in Myanmar, giving Kadyrov an opportunity to criticize it for inaction. 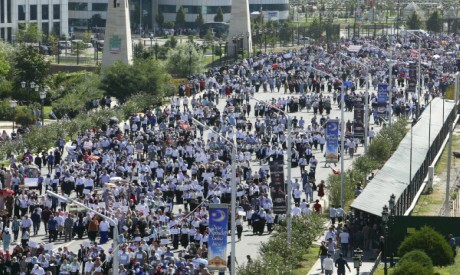 State television footage from Grozny, the capital of the predominantly Muslim Chechnya, showed tens of thousands rallying in the city's main square to support the Rohingya minority. In his address to the rally that was interrupted with shouts of "Allahu akbar" ("God is great!" in Arabic), Chechen leader Ramzan Kadyrov compared the violence against Rohingya to the Holocaust. Kadyrov, who has ruled the republic for more than a decade, keeps a tight grip on Chechen society, and any public displays there are carefully orchestrated. Local police authorities reported that 1.1 million people attended the rally. The entire population of Chechnya is 1.4 million, according to official statistics. In a video released earlier, Kadyrov issued a vague threat to "go against" the Russian government if it does not act to stop the violence against the Rohingya minority. "If Russia were to support the devils who are perpetrating the crimes, I will go against Russia," he said. Russia has been developing military ties with Myanmar in recent years. Russia's defense minister hosted Myanmar's commander in chief in June, and Russia has been selling arms to the South Asian nation including some of its most advanced fighter jets and artillery systems. Kadyrov is a son a separatist leader who switched sides to support the Russian government after two bloody wars in the 1990s.